LONG BEACH, Calif. (DATE, 2017)―Toyota Motor North America, Inc. (TMNA) will build the world's first megawatt-scale carbonate fuel cell power generation plant with a hydrogen fueling station to support its operations at the Port of Long Beach. Announced today at the Los Angeles Auto Show, the Tri-Gen facility will use bio-waste sourced from California agricultural waste to generate water, electricity and hydrogen. When it comes online in 2020, Tri-Gen will generate approximately 2.35 megawatts of electricity and 1.2 tons of hydrogen per day, enough to power the equivalent of about 2,350 average-sized homes and meet the daily driving needs of nearly 1,500 vehicles. The power generation facility will be 100% renewable, supplying Toyota Logistics Services' (TLS) operations at the Port and making them the first Toyota facility in North America to use 100% renewable power. "For more than twenty years, Toyota has been leading the development of fuel cell technology because we understand the tremendous potential to reduce emissions and improve society," said Doug Murtha, Group Vice President- Strategic Planning. "Tri-Gen is a major step forward for sustainable mobility and a key accomplishment of our 2050 Environmental Challenge to achieve net zero CO2 emissions from our operations." Tri-Gen is a key step forward in Toyota's work to develop a hydrogen society. In addition to serving as a key proof-of-concept for 100% renewable, local hydrogen generation at scale, the facility will supply all Toyota fuel cell vehicles moving through the Port, including new deliveries of the Mirai sedan and Toyota's Heavy Duty hydrogen fuel cell class 8 truck, known as Project Portal. 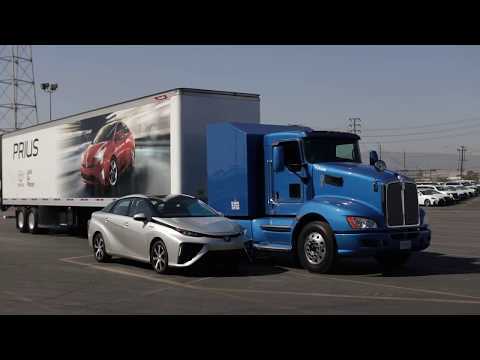 To support these refueling operations, Toyota has also built one of the largest hydrogen fueling stations in the world on-site with the help of Air Liquide. Tri-Gen has been developed by FuelCell Energy with the support of the US Department of Energy, California agencies including the California Air Resources Board, South Coast Air Quality Management District, Orange County Sanitation District, and the University of California at Irvine, whose research helped develop the core technology. The facility exceeds California's strict air quality standards and advances the overall goals of the California Air Resources Board, the California Energy Commission, and the Air Quality Management Districts of the South Coast and the Bay Area, who have been leaders in the work to reduce emissions and improve air quality.